Carnitas are the best! These are easily just as good as what you’d find in any Mexican restaurant but you get to enjoy them at a fraction of the price in the comfort of your own home! 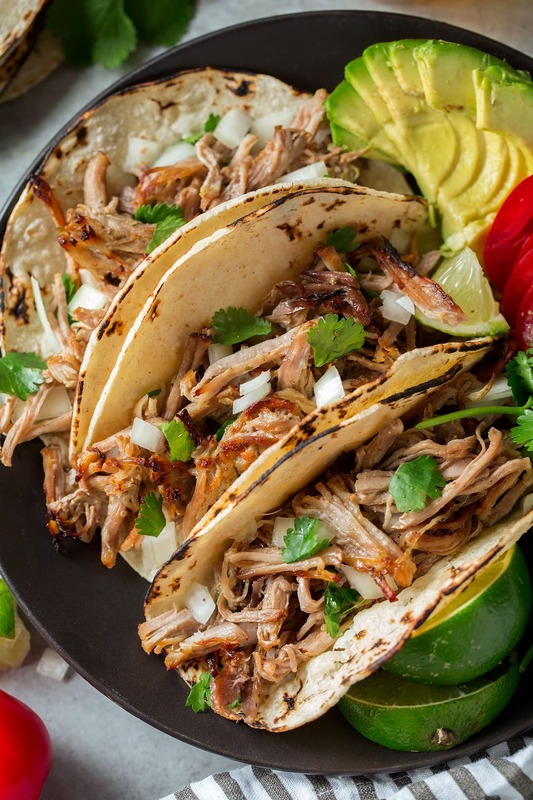 They’re brimming with those rich, authentic flavors we all love from the classic pork carnitas tacos and they’re much easier to make than you’d think. 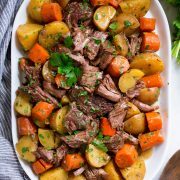 This recipe gives you both options of cooking in either the Slow Cooker or Instant Pot so use whichever you own for incredible results either way! As a matter of fact the slow cooker or pressure cooker does most of the work. You just add everything to the slow cooker or Instant Pot then cook for 8 hours in the slow cooker, or 1 hour in the Instant Pot. Easy as that. Throw the carnitas into tortilla’s, add some cilantro and diced onions and tada. Such a satisfying dinner! All your friends/siblings/boss/grandma/dog will want this recipe! If you haven’t had Carnitas you are probably trying to figure out exactly what “Carnitas” means. It’s a spanish word meaning “little meats.” It’s a Mexican dish and generally it’s made by braising or roasting pork then shredding it and simmering in lard or vegetable oil until crispy. But here we switch that up and use the slow cooker/pressure cooker, and broil the pork it instead of sautéing it in oil to get that same crispy effect. Broiling it takes less time, creates less mess, and requires less oil. And I go for semi-crispy. I like the ends of the meat to be nice and crispy but I recommend that you don’t overdue it. You don’t want to dry the meat. 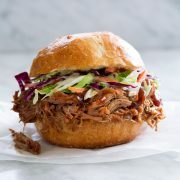 Place pork in slow cooker. Pour in chicken broth, orange juice and lime juice. Sprinkle in salt, pepper, cumin, oregano, coriander, chili powder and cayenne pepper, onions and garlic. Cover and cook on low heat 8 hours. Leave liquid in slow cooker, remove pork and shred with two forks. Spray a rimmed 18 by 13-inch baking sheet with non-stick cooking spray. Place pork on baking sheet, pour over 1 cup reserved broth (try and strain out onions when ladling broth out), drizzle with oil and toss and spread into an even layer. Position oven rack near broiler and preheat broiler to high. Broil until pork is browned and crispy in places about 3 – 6 minutes. 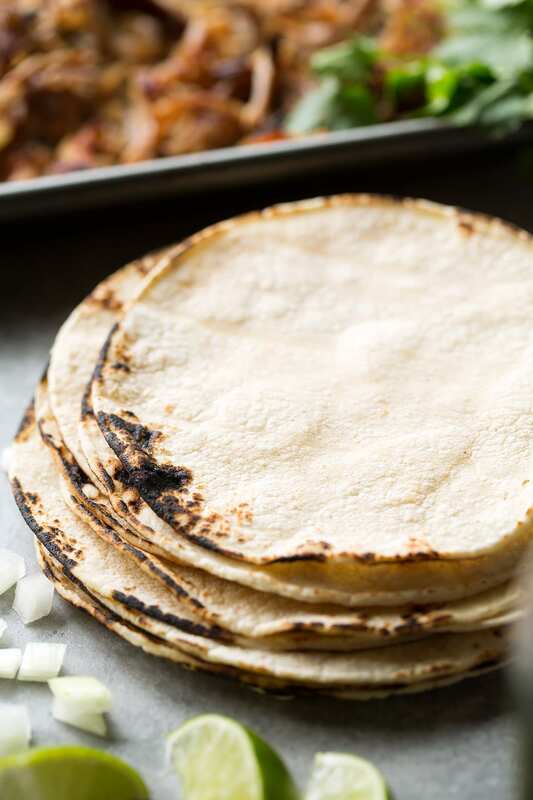 Serve warm in tortillas with desired toppings. 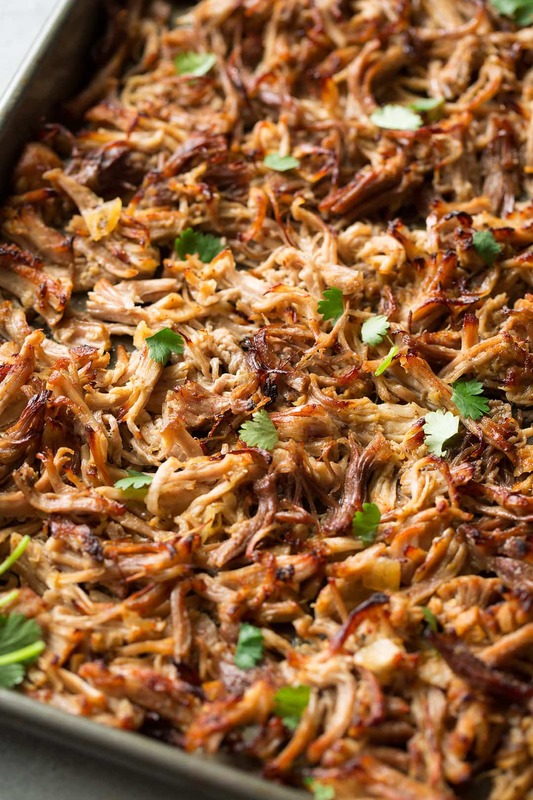 Cut pork into 4 chunks and place pork in Instant Pot, pour over chicken broth, orange juice and lime juice. Cover and seal lid (make sure valve is set to “sealing” position), press “manual” (or high pressure) and select 60 minutes. Once cooking is done, let pressure come down naturally for 10 minutes then use quick release method to release any remaining pressure. Once steaming has stopped remove pork from pressure cooker while leaving broth in pressure cooker. Shred pork and proceed with broiling method starting at step 5 above. What About an Oven Option for Carnitas? If you don’t have a slow cooker or pressure cooker I’ve also made these in the oven. Preheat oven to 325 degrees. Cut pork into 4 portions place in a large pot and cover, then and roast with the broth, juices and spices until it easily shreds with a fork, about 3 1/2 – 4 hours. Then proceed with the broiling method as noted. And why didn’t I brown the pork first in the recipe? Because you brown it at the end after shedding so why brown it twice? 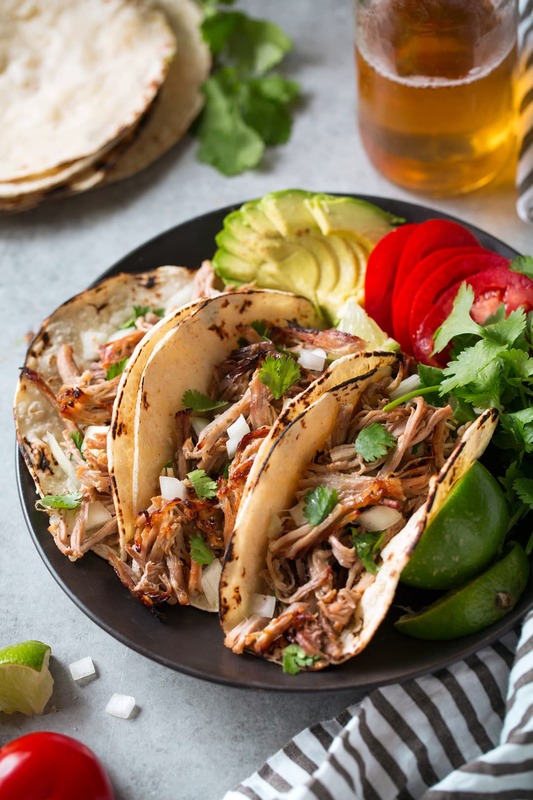 I’ve made these carnitas all three ways, slow cooker, instant pot, and oven roasted. Each of them works great so use what you have and what’s convenient for you. 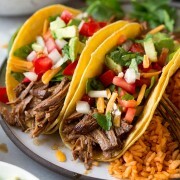 These Carnitas are just as good as what you'd find in any Mexican restaurant! They have the best flavor and that crispy texture will have you reaching for piece after piece. This is one of those recipes that everyone in the family can agree on, they're just too good! Broil until pork is browned and crispy in places about 3 - 6 minutes. Cover and seal lid (make sure valve is set to "sealing" position), press "manual" (or high pressure) and select 60 minutes. Instant Pot method will take approx. 80 minutes + 10 minutes prep. Recipe source: Cooking Classy, recipe updated from archives originally shared July 2013. 1. *Italian oregano can be substituted if you can't find Mexican oregano. 2. For an oven option see notes in post above. 3.Tortillas and toppings not included in nutritional value. Sharon Bond: It’s five years after your post, so I have no clue if you’ll see my question. However, I can but try! I will need to use the oven method for the carnitas, but your recipe doesn’t specify a temperature that I can find. Preheat oven to 325 degrees. Sprinkle pieces of pork evenly with salt and pepper and rub into pork. Heat olive oil in a large cast iron pan over medium-high heat. Once oil is hot, add in two of the pork pieces and brown on all sides until well browned, while moving pork as little as possible while browning. Remove pieces and repeat with remaining two pieces of pork, then remove pork and add in onions. Saute onions until golden about 2 minutes per side and adding in garlic during last 30 seconds of sauteing. Reduce heat to medium-low, add in chicken broth, orange juice and lime juice and scrape bottom of pan to loosen browned bits. Return pork to pot, sprinkle evenly with orange and lime zest, chili powder, cumin, paprika, coriander and cayenne pepper and fresh oregano (you want half of the zest/spices to go over the tops of the pork and the other half to go into the broth). Add cinnamon stick to broth in center of pot. Transfer to oven and bake, uncovered in preheated oven 3 – 3 1/2 hours rotating pork once during baking and covering pot at about 2 1/2 hours as needed to prevent excessive browning and to reserve a small amount of broth (you want about 1/2-inch of broth when it’s done cooking to toss the shredded pork into). 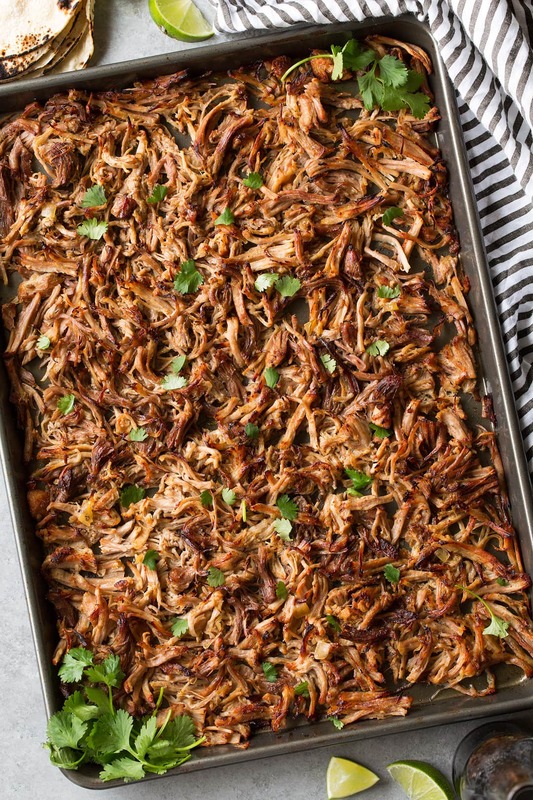 Remove from oven and shred or dice pork into bite size pieces, while removing any pieces of fat. Return to broth in pot and toss to evenly coat. (Optional step) Heat oven to broil and return pot to lower half oven and broil 4 – 5 minutes, then remove from oven and toss. Return to oven and broil 4 – 5 minutes longer. Remove from oven, serve warm over corn tortillas with diced avocados, chopped cilantro and lime juice. Optionally you can also serve with lettuce, Monterey Jack, pico or salsa, hot sauce or sour cream.